Attaleiates no doubt subsisted on the familial dole for a time before he joined the professional world of the courts. As his career prospects brightened and his intellectual labor engendered tangible monetary returns Attaleiates created a household. 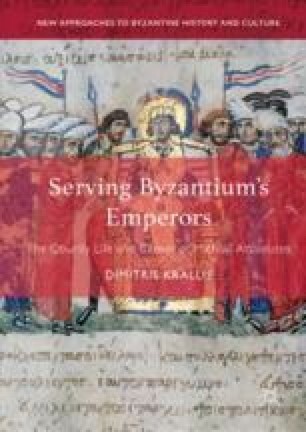 We do not know much about the world of affection that may or may not have marked his two marriages, though this chapter does offer examples of Byzantine concerns with passion, love, and sorrow. It is rather the material impact of Attaleiates’ marital unions that is examined here. A careful reading of the Diataxis allows us to map the judge’s household in both Constantinople and the provincial city of Raidestos. In these concrete places, the material transforms into social relations as economic activity situates Attaleiates firmly in communities.